This week I am traveling in Stockholm and its surrounding archipelago. While I’ve visited the beautiful capitol before, I have never ventured into Stockholm’s surrounding archipelago which consists of some 24,000 islands. Within an hour you can find yourself on a tiny island surrounded by nature, and feel as if you are light years from the maddening crowd. More on that later, but in the meantime, I post this from the small island of Grinda. With the outside air cool and fresh and a fire crackling inside the Grinda Wardshus great room, I can’t help but think of Clam Chowder. Blame it on my New England roots, all right, but a bowl of chowder sings summer to me – no matter if it’s a sunny day at the beach or an afternoon cloaked in fog. Use the smallest clams you can get your hands on, such as little necks, middle necks, or, if you are on the U.S. west coast, manila clams. Serves 4 to 6. Heat the oil in a large pot over medium heat. Add the bacon and fry until the fat is nearly rendered (it will continue to render as the vegetables cook). Add the onion and leek and sauté until softened, about 2 minutes. Add the celery root and potatoes. Sauté until the vegetables being to soften, about 5 minutes. Add the milk, cream, stock, bay leaf and thyme. Bring to a boil, then simmer until the vegetables are tender, 10 to 15 minutes. Add the clams. Reduce heat to medium-low, cover and simmer until clams open, stirring occasionally, 8 to 10 minutes. Discard any unopened clam shells. Season to taste with salt and pepper. Serve hot garnished with fresh thyme sprigs. Oh Lynda! Have the most fabulous vacation! 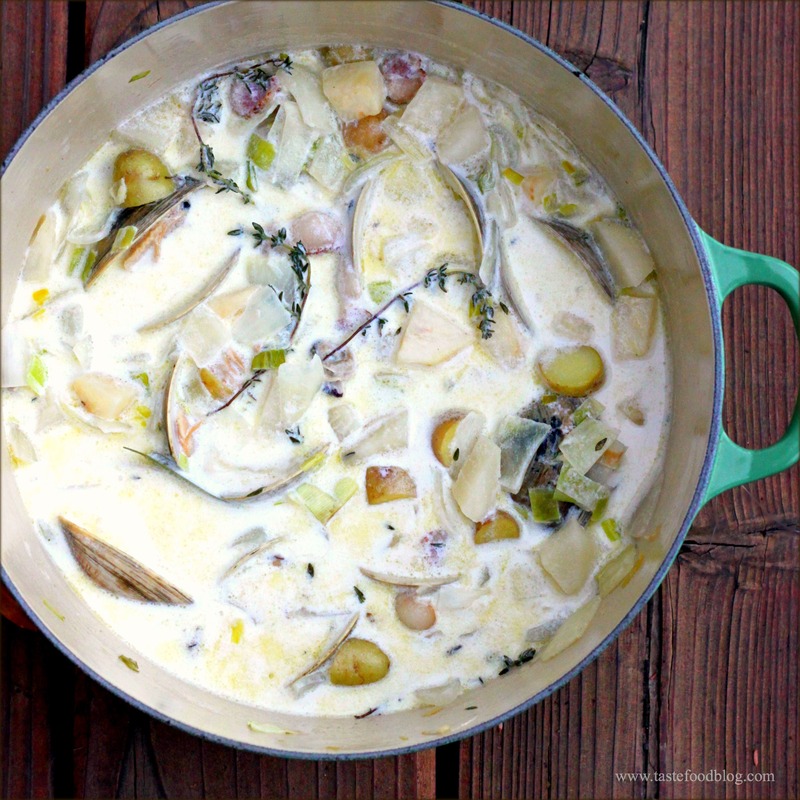 I’m drowning in the coastal fog so the Clam Chowder looks very inviting on this brisk summer day! I cannot wait to read about your trip to Sweden when you are home and settled. Enjoy every minute. A wonderful chowder. Have a great time in Stockholm/Sweden! That’s the best looking chowder! Oh My…..I don’t suppose you could swing through Boston on your way home and whip me up a batch of this goodness?